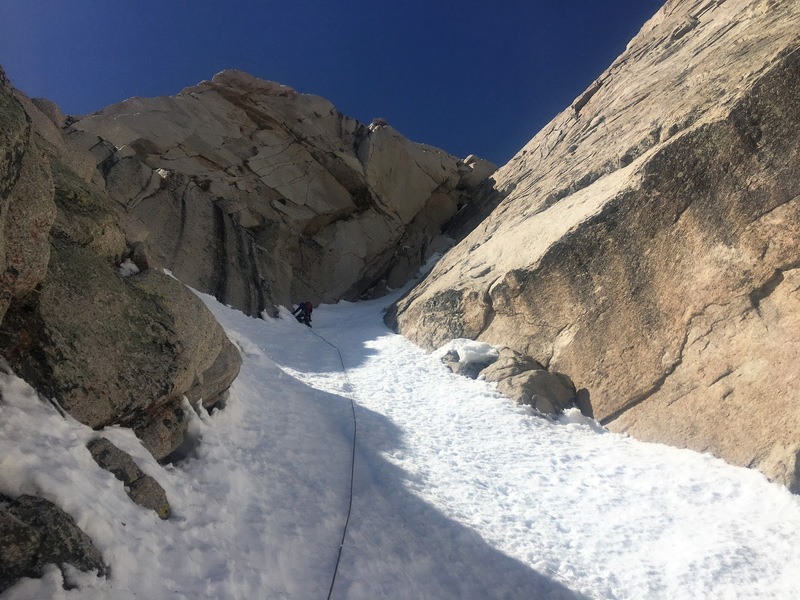 In early March my colleague Andy Stephen and I climbed the Winter Chimney on Lone Pine Peak. This route has been on my radar ever since reading this trip report. This fun route is worth doing for anybody who is interested in alpine climbing and the Sierra Nevada. All of the photos below are Andy's, as I lost my phone that morning (more on that below). 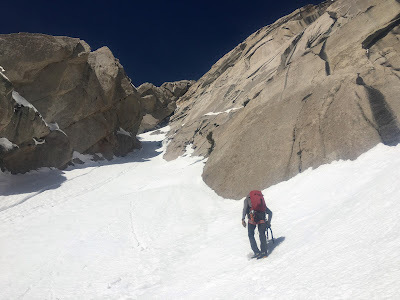 Andy and I were guiding a trip up the Mountaineers Route on Mount Whitney in early March, so it made sense to stick around Lone Pine and tick this route. After celebrating a successful Whitney summit with burgers and shakes at The Mount Whitney Restaurant I ran a few errands in town and we drove up the Tuttle Creek Road as far as Andy could rally his minivan (a lot farther than I expected). Though it seemed like we made a plan about what time to wake up in the morning I definitely misunderstood as it was Andy's voice, not the notes of "Illuminate" (my alpine start ringtone) that woke me up the next morning. Andy was a gentleman about it, and several cups of coffee and some unnecessary vehicle shenanigans later we started huffing up the road to the Stonehouse. Neither of us had ever been there, so we spent a few minutes exploring the place. About 25 minutes later, after we had left the Stonehouse, crossed Tuttle Creek, and were stopping to put away headlamps and put on sunscreen I noticed my phone was missing. Andy was gracious and patient throughout the agitated searching and backtracking that ensued. I felt like an idiot, but after 1.5 hours of frantic looking I also felt like I wasn't going to find it. It being a clear day the temperatures were rising, and we were concerned that it might be too warm on the route after all the time we just burned. We decided to continue up the approach anyway. After all we were there, and at least we could get the approach figured out for a subsequent trip. The slope of big boulders that precedes the gullies didn't seem too bad, probably because much of it was covered in supportive snow. All the snow meant that we engaged in only minimal scrambling to get up the first and second gullies (about 2000 feet of elevation gain) to the Winter Chimney drainage. 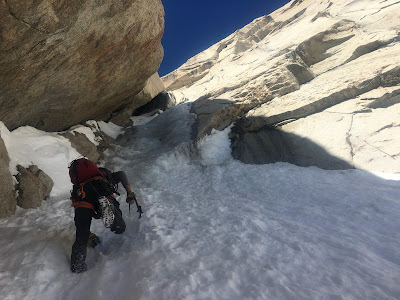 We definitely felt the time wasted in the phone search here, the gullies were fully in the sun, the snow wasn't super firm, and it was hot. A bit more hiking (probably to about 10,200ft) and we could see the Winter Chimney route and there was definitely ice! In the bottom of the Winter Chimney drainage. Andy Stephen photo. Kicking out a stance at the base of our first pitch. Andy Stephen photo. A few more minutes of slogging and Andy and I were kicking out a platform at the base of the first pitch. From here on up it got progressively cooler, and I began to regret peeling off my long underwear at a break at the bottom of the first gully. The first pitch was about 30m of nice WI2. Andy quickly got the rope up there and brought me into a cave at the base of a bombay chimney. One wall of the chimney was covered with thin but well bonded (and clear!) ice. 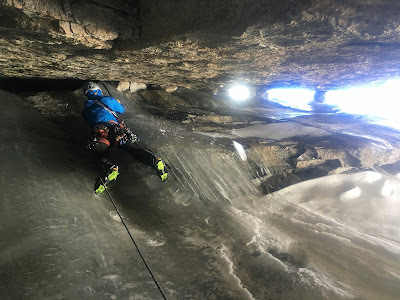 A few body-lengths into this lead and I couldn't wind up to swing my ice tools anymore, it was too narrow. At this point I started chimneying in earnest and headed directly out, slinging a seemingly bomber chockstone along the way. Once out of the slot I continued up some ice, then snow, and brought Andy up. In the first chimney. Andy Stephen photo. A long pitch of mellow snow above the first chimney. Andy Stephen photo. From this point we could see the whole upper part of the route. We hiked up maybe 60m of snow and I augered in as Andy took the next lead. It was one of the classiest pitches on the route: a bit of thin ice to some drytooling around a big chockstone with ice pouring over the top, then more moderate ice to another belay in a cave below another chimney, this one topped by a roof. Once again it was my lead and once again I found myself using a stimulating combination of ice climbing technique and chimney technique. Before long I arrived at the roof. It was kinda long and all dry rock. I wasn't particularly high on trying to pull it with boots and crampons on, so I cast about for an escape. I found a tight tunnel-through behind the roof. Tools went first, then me in just the right orientation, and last my pack dangling from my harness. I belayed in a jumble of boulders just above. Looking down the first part of one of the better pitches on the route. Andy Stephen photo. Andy took the next pitch and again it was a great lead, starting with some run-out dry tooling on positive edges as the chimney shrunk down to a corner and finishing with better protected mixed climbing in that corner. This pitch took us to the top, where the wind was ripping. With little more than a fist bump between us we coiled the rope and started hustling across the summit plateau to the start of the descent. I think this route deserves more action, so below are a few thoughts future climbers of this route might find useful. I think the ice on this route is formed from snow melting on the summit plateau above. A healthy winter snowpack with some period of melt-freeze action prior to the climb probably provides ideal conditions. Mid to late winter is probably best. That will also give the approach the most time to fill in with possibly helpful snow. The chimney where the route proper exists receives little direct sunlight in the winter (it was cold in there) so refreezing is probably a given too. We clearly encountered a lot more snow and ice on the route than the 2007 team did. 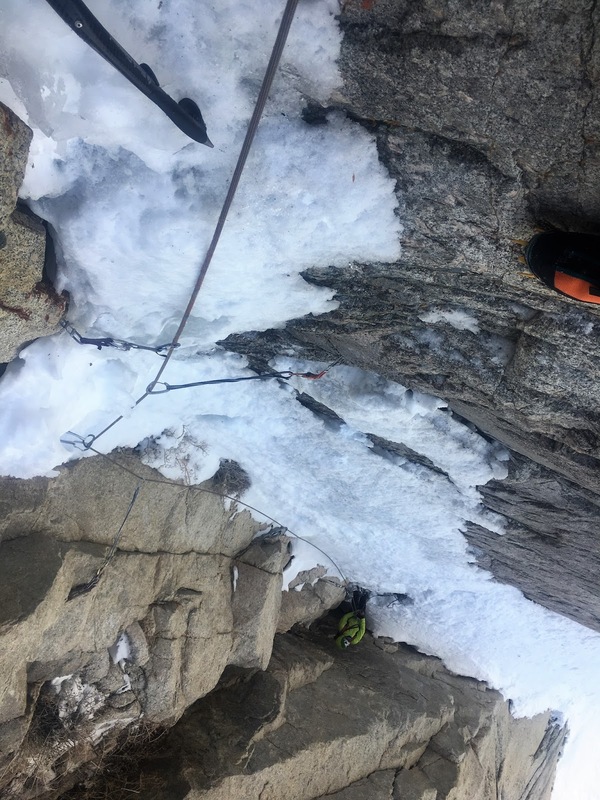 I believe the first three pitches of the Winter Chimney proper that they climbed were covered by snow on the day Andy and I were there. The first pitch we roped up for was the one they described as, "a beautiful 100 foot pitch of baby blue water ice". We brought one pair of rock shoes for an emergency and they stayed in the bottom of Andy's pack. The only spot where they could have been useful is maybe pulling the roof that I tunneled around. I often find that bringing multiple types of footwear (on any type of climb) ultimately slows things down. Deciding if and when to switch and then doing so often seems to take a lot longer than just making do with what you're wearing. Anyway, it was cold enough that day that putting on rock shoes would definitely have meant risking a cold injury. After reading some horror stories about the descent I spent some time at home sussing it out on Google Earth. We brought a couple of ice screws, stoppers, and cams to a #3. The smaller cams (.2 - .75) seemed to get more use. We brought a couple of knifeblades but didn't use them.